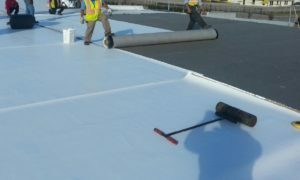 BBG Contracting Group is experienced in the installation and maintenance of single ply roofing. Single Ply roofing is the fastest growing segment for flat roofing solutions. TPO is the most popular single ply roof currently on the market. TPO is naturally reflective and meets most of the reflectivity requirements for Cool Roofs. Single ply roofing is not asphalt (oil) based, so their pricing is not as volatile as asphalt-based roof materials. Installation costs are generally lower for these roofs and can provide great value.